You have nothing to fear, my beloved child. All for you, my daughter. For it slays the monsters, never you. My dear and beloved child. And don't you see and hear the protection I've offered? Know always, you are safe, and loved. Who runs to her Mother, seeking solace, comfort, and aid. Kali, with her long and at times complicated history, may well be one of the most interesting, and misunderstood deities of all time, at least to the general public, especially in the West. When we first hear the name Kali, if we've heard of her, we tend to think of this great goddess as she's portrayed in Indiana Jones in the Temple of Doom - the bloodthirsty object of worship by bloodthirsty people, who delight in human sacrifice and evil. But, this amazing Mother, Warrior, Creator and Destroyer offers a much different path than this to those who chose to pray to her in real life. 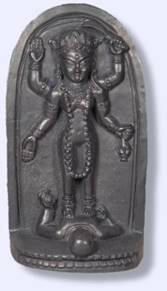 Historically, it is hard to trace where Kali's worship first began and by what people, though she is most well known in modern times for her worship in Indian, Nepalese and Balinese culture. Her most famous story, in which she emerges from the Hindu goddess Durga’s forehead to battle demons and save all creation, is recounted in the Devi Mahatmya (roughly, “Glory of the Goddess”), which was written around 400 AD1 though this is a matter of debate among scholars. However, given that most texts from this period throughout India seem to have existed in oral form before being written down, it is likely (especially given how fully formed the mythology already appears in the Devi Mahatmya), as some scholars have suggested 2, that she was being worshipped well before this. As Barbara Walker points out in her entry on Kali in the Women's Encyclopedia of Myths and Secrets, there are goddesses, festivals and even cities bearing either the name or description of Kali ranging from Ancient Greece to Finland. Regardless of origin, Kali (whose name is roughly the feminized version of the word for “time”3) represented to the people of ancient India the birth and death Mother; giving life and absorbing the dead back into herself, she birthed, existed in, and devoured all creation. Hailed in Hindu mythology as dancing the universe into being, those who chose to pray to the Kali as their Mother referred to her as “the Treasure-House of Compassion”;4 a deity whose fantastic power and ferocity was only matched by her love for her children. While most spiritual practices around the world speak to the duality of existence (Heaven and Hell, right and wrong, black and white) Kali demands the opposite; as both giver of life and it's taker, both manifest deity and cosmic, she calls to her children to see beyond these labels, beyond duality to true freedom. She is not a Crone Goddess, or a Mother Goddess, or a Maiden Goddess - she is all of them. Likewise, as Ajit Mookerjee mentions in his book Kali: The Feminine Force, the Mother “refuses no one”; this may explain how her worship spread across such wide cultural differences. In Hinduism (particularly clearly in its Tantrik offshoot, Shaktism), all goddesses are believed to be manifestations of one divine feminine presence: Devi, meaning literally, “Goddess”.5 Likewise, there are also many, many, MANY different manifestations of Kali herself - too many to list here. Perhaps her most famous manifestation (so famous in fact that many in modern times don't realize it is Kali) is Tara 6, whose worship has spread across continents and religious differences. 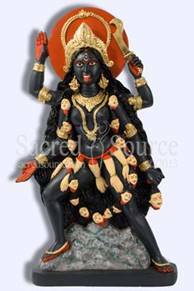 According to Tantriks, however, Kali is the Mother in her most ancient form; merely taking other appearances and names to perform the cosmic functions needed for existence to continue.7 Understandably given the variety of duties this entails, some of her manifestations are frightening at first, such as Chinnamasta, who typically appears in images as holding her own severed head, while thick jets of blood stream out her bloody neck to the waiting mouths of her attendants!8 However, once the shock has worn off, the symbolism in images like these become clearer; she is willing to feed her children with her own life force, by extreme measures if necessary. And as Kali, she is often shown with severed heads, bloody swords, and a belt made of human arms - representing the death of ignorance in those who worship her, her power to destroy any obstacle, and the karma she absorbs to help her children, respectively.9 This doesn't mean, though that her fearsome nature is undeserved; as mentioned above, in the Devi Mahatmya, she manifests for the purpose of eradicating demons who even the gods can't handle. They were already worn out from trying to fight the demons, and failing.10 She is more than capable of doing the job; it also seems asking your mom for help is not a wholly human trait. Existing in all beings and all things (even the awful and/or scary ones) Kali can be fearsome; she can be gentle. She can be terrible, as well as beautiful. In my own personal experience, the one thing she always is, is loving. 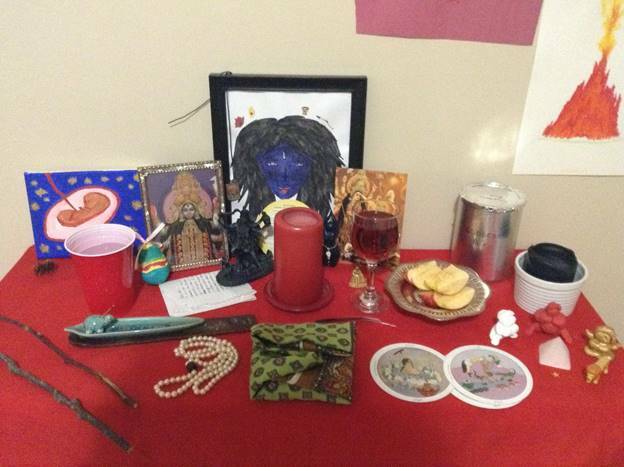 I wanted to include a section here to describe (briefly) my own personal journey with Kali. Even though it's a journey that's far from over, I have learned a lot already and hope this info will help someone. When I began training through OWM, I was not actively worshipping the Goddess; I considered her more of an archetype than an sentient, real being. A little background - I am a 20-something Caucasian woman who was raised in a Christian background that leaned more towards fundamentalist than progressive. My parents, though they did their best, disliked displaying “sappy” emotions, and most of my memories of them from childhood are of angry or dismissive behavior from both. I grew up, and lived most of my life up to this point, avoiding people whenever possible (I would almost certainly just make them mad and besides I'm bad with people.) and pretty much despised myself. I also have a lot of anger stored in there. I can't pretend that I know yet exactly how to handle the anger part; but part of that is because until a few months ago, I didn't realize the anger was even there. This is one of the gifts (and it is a gift, even if rage isn't exactly pleasant) of Kali; she brings up your baggage, the things you have hidden away but need to confront if you want to grow. When I first prayed to her, I was so sure I would enrage her, somehow, that I began sobbing uncontrollably when I tried to speak. Eventually, through regular practice, I realized that this old fear in me had nothing to do with Kali at all; this took a while for me to figure out, but she helped me. And over time, even in the relatively short time I've been working with the Ma, I've gone through a tremendous healing process - though I still struggle with old fears and anger at times, as I said, I'm learning to cope with the emotions that have reared up, after I spent so many years imprisoning them. But every day it seems like I learn new things about myself, and with that my confidence in myself grows, bit by bit. I no longer fear interactions with people the way I used to, and feel like I'm starting to actually understand that I'm kind of a cool person, and capable of way more than I thought. Because that's the magic of Kali Ma: she will bring up all your old, scary dark things, which can be rough. But, she will stay with you and help you every step of the way. Because even if you don't believe you are strong enough to handle these things, She knows you are; and the only time I've ever felt anything approaching anger from her was once, when I drew a picture of her for my altar, and started beating myself up for not making it “good enough”. I was going to remove it from the altar, only to feel sadness and rage well up suddenly inside me in response. Every time I've had a particularly rough moment or day, even if it's just mundane stuff (being broke, a fight with a friend, etc) I know I can pray to her and I always receive an answer. For all her frightening appearance, I have never experienced such feelings of love and safety that she's blessed me with, while still always encouraging me to heal and grow beyond what I thought were my limits. I am incredibly grateful to have her in my life. This ritual is designed to help you let go of pain and baggage from your past, and leaving you feeling empowered from within. Because of this, it is specifically designed to let your Younger Self out to play - the part of you who is unashamed of her own pain or fear. Please give some thought beforehand as to what you want to let go of; it can be something specific, like pain from a childhood trauma, or something more general, like unhealthy fear. You may get somewhat emotional during this ritual - that is a good thing, and in fact part of the goal. Read over the ritual first to get an idea of what specific items you'll need. ● Purify with sage incense or salt water. ● Call Elements in your preferred manner. ● Ask Mother Kali to join your circle. ● Ask the Mother to help you let go now of whatever you've chosen to release from your life - explain why you feel the need to do so, how this thing has hurt you, and know you have Her support. This explanation is more for you than Her; to help solidify to yourself that you are ready to let this thing go. Talk about how you hope to feel after you have let this go. ● Light your black candle and grab your crayons/drawing supplies. Talk now to the Mother about the feelings this thing brings to you - let everything come out. Talk about where you think it came from, how it holds you back - and as you do all this, begin drawing or writing on your paper. Use colors that feel right to represent your soon-to-be-released burden; draw whatever comes to mind, whether that be stick figures, symbols, or angry wild squiqqles. Write words if you like - don't worry about being orderly, and keep talking and unloading to the Ma as you do; if your end result is chaotic (or beautiful), it is equally fine. Try to experience this thing you are releasing as much as possible in this moment, in this safe space; the first time I did this ritual my page ended up a wild mess with tear drops all over it. Scream, if possible and needed, go through multiple sheets of paper if required. ● Once you feel you have unloaded as much as you can into your paper, take a moment to breathe. You have just confronted a monster, no matter how big or small. Know that you are stronger for having done so. ● Rip apart your pictures as vigorously as possible. Blow out your black candle, or let it burn down - the important thing to know is that you have now moved on, and are healthier than before. Dispose of the picture and candle afterwards. ● Take your remaining paper and crayons/drawing supplies, and draw now a picture (or write something) that represents how strong you are as a woman; if you have been in a very dark place for a while, and struggle with this, remember what I said above - you have just confronted a monster. Even if you doubt yourself, you have strength. You can list your strengths if you like, or draw a picture of yourself as you would like to be - an Amazon lit from her own power from within. Again, it can be simple stick figures, or elaborate; have fun here, and use your imagination. Silly is preferable to overthinking (remember the Young Self!). ● Present your picture to the Mother, saying “Look and see Mother, how strong your daughter is!” She already knows this; you need to hear it. ● Go to each quarter of your circle, to each element, and do the same; for example, “Look, power of fire; and see how strong I am!” Present to the universe your new-found strength. ● When you are ready, return to center, and place your new, true picture on your altar. This one you will save - it's a reminder of your strength, and your ability to overcome challenge and pain. Let your red candle burn itself out. ● Say goodbye to Her, and the elements in your preferred way, and open the circle.